Although near to both Kathmandu and Pokhara, the Ganesh Himal Region has remained a well-kept secret to all but Nepal’s most avid trekkers. The unexplored area is concealed between the popular destinations of Langtang National Park and the Manaslu Conservation Area Project. Wildflowers flourish, and waterfalls embellish the lush hill scenery in a land blessed with wide ranging geographical, cultural and biological diversity. Sensational viewpoints feature the sublime Himalaya to the north. Most prominent is the Ganesh Himal Range -- a family of peaks among the most attractive of the entire Himalaya. The Ganesh massif is named in honor of Hindu deity Ganesh, son of Shiva and Parvati. 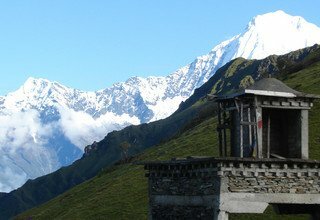 The Ganesh Himal area has some excellent viewpoints that offer magnificent views of peaks and valleys. Most rewarding are the magnificent Ganga Jamuna -- twin waterfalls -- Kalo, Seto and Ganesh kunda, hot spring and Tripurasundari temple and especially the hospitable people that inhabit the region. 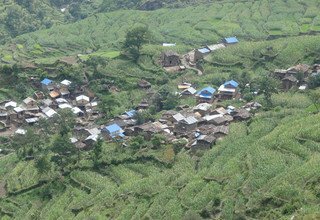 The Ganesh Himal Region lies in Dhading, Gorkha, Rasuwa and Nuwakot districts. The area is populated mainly by Tamang Gurung and Ghale to the north, and Bramhin, Chhetri, Dalit, Newar and Chepang at the lower elevations in the south. Visitors are warmly welcomed by all with a friendliness that makes Nepal legendary. At least 10 separate trekking itineraries are recommended and await travelers promising unforgettable adventures. 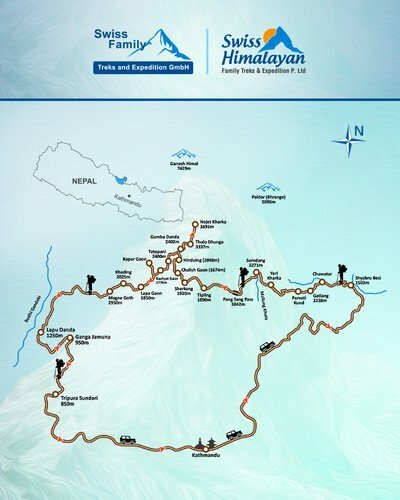 Government registered trekking agencies will be happy to set up visitors with a guide and all necessities for exploring this captivating, undiscovered region. The area is easily accessed by the Prithvi Highway and Pasang Lhamu Highway along the southern fringes, connecting Kathmandu and Pokhara. Another adventurous option is to hike in from the Tamang Heritage Trail of Rasuwa and follow the Ruby Trek, so named for the precious stones found in the Area, as well as Bhalche in Nuwakot, Gorkha and Dhading Besi. Day 1: Arrival in Kathmandu and meet with our staff at the airport and transfer to Hotel. Welcome drink and short briefing about your trek, relax. The trek begins from Shyabru Besi (1503m) — the gateway to the Langtang National — at the confluence of Bhote Koshi and Langtang rivers. Passenger buses leave for Shabru Besi from Kathmandu. Mesmerizing scenic driving through Trishuli Bazaar, Ramche Gaon and Dhunche Bazaar takes us to this beautiful village. Though the road is narrow and serpentine, amazing landscape along the way ensures good start to your trek. Stay overnight at tented camp. A dirt track climbs uphill from Shyabru Besi until Bahun Danda Pass and descends to Tamang settlement of Gatlang — a popular village along the Tamang Heritage Trail. We can also hike to Gatlang via Chawatar. Gatlang is a Tamang village with unique customs and craftsmanship in a magnificent setting. Above the villages lies the Parvati Kund — a scared lake — that draws thousands of pilgrims during the Janai Purnima festival. Stay overnight at tented camp. The trail passes through pine and rhododendron forest to a lunch point of Yuri Kharka before continuing to Khurphu Bhanjyang and then dropping down to the Somdang River that separates Rasuwa and Dhading districts. A sprawling mining compound, which is no longer functional, lies a few hours north of the river. The trek passes through a scenic valley featuring the 200 m Chukarma Waterfall. The former mine leaves a lot be explored and is the site of a 1.4 km tunnel dug into the mountain to extract zinc, copper, tin, crystal and even highly-prized rubies. Stay overnight at tented camp. Pangsang Kharka is a viewpoint southwest of Somdang village with a broad panorama of the surrounding terrain. Lying north are the peaks of Manaslu and the Ganesh Himal Range. The large meadow is graced with a giant entry gateway and is a sensational location for camping and breathtaking scenery. The whole Ganesh Himal region is blessed with abundant herbal plants. Previously, medicinal herbs were taken to Tibet along an ancient trade route and exchanged for salt, livestock, wool and turquoise. Locals are initiating to build a basic lodge accommodation near the Pangsang Pass. As the lodge has not been built, trekkers are recommended to take own tent for the night camp. They are highly recommended to take dry fruits or food for dinner. Stay overnight at tented camp. Descend to Tipling, a large village with two Buddhist monasteries and a Protestant and Catholic Church. Along a ridge top to the east lies a gomba and cremation ground for both Buddhists and Christians lined with colorful flags. Descend to cross the Adha Khola on a box bridge and ascend to the sister villages of Shertung and Chalish, overlooking the fertile river valley and abundant fields. Shertung is inhabited mainly by Tamang. The name Shertung means &apos;place of gold&apos;. According to a legend, two brothers in search of gold were led here by a dream and thus the settlement was born. Tamang people here perform shaman dance and horse dance, which are believed to have been inspired from Tibetan culture. The Jhankri (shaman) tradition is popular in this area with the worship of natural forces and indigenous local deities interwoven with Hindu and Buddhist practices. Chalish is inhabited primarily by Gurung, Ghale and Kami. The hospitable people of this area have unique customs and craftsmanship and traditional dances, including a hospitable welcome dance and Ghatu Dance. Dohori is also popular with call and response between male and female participants, a type of courtship ritual, complemented by folk music. Some dances depend on the time of year and take place during festivals including the Maruni Dance during Dashain and Tihar, Hai Nelo Dance of Tihar, and the Ghatu (Ghasiri Dance) that occurs during Chandi Purnima in the Nepali month of Chaitra. Gurung men traditionally wear vangra -- a woven, embroidered cotton cloth tied at the ends that serves as a pouch for carrying goods. Sri Tinkanya Devi Mandir lies above Chalish. Local women tie bits of cloth or leave a bangle representing a wish to be fulfilled near a small pool of water surrounded by Barmase or periwinkle flowers. Shertung or Chalish village is the only village in this region. From here, trekkers, who have planned short 7-day trek, descend to Jharlang village after a walk of about 5-6 hours and in next day walk to Darkha Gaon and from there toward Dhading Besi — the headquarters of Dhading district. Stay overnight at tented camp. Hindung is a Tamang village of around 550 inhabitants. Crystals and rubies are found in the areas to the north. Locals also collect Yarsagumba — a medicinal herb — in the surrounding highlands. Stay overnight at tented camp. Thulo Dhunga is a camp that offers magnificent waterfalls cascading down. The area is rich in terms of flora and fauna. Wildlife found in the area includes musk deer, jharal, wild boar, langur, leopard, pheasant and partridge. Vegetation includes bamboo, rhododendron and juniper among abundant wildflowers. Stay overnight at tented camp. The trail continues steeply with occasional jaw-dropping views of the snowy peaks. Continue through seasonal grazing areas to eventually drop into an immense green meadow and splendid camp site known as Nojet Kharka. Stay overnight at tented camp. 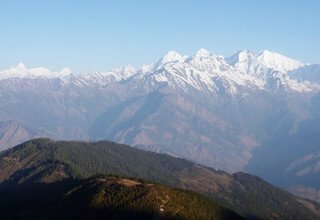 A climb to the ridge to the northeast, Dobra Danda, is rewarded with a supreme viewpoint of towering Ganesh Himal. The mesmerizing sight is unforgettable. Two small lakes shimmer below at the foot of the Himalaya. Kalo Kunda (black lake) has waters that mirror the awe-inspiring surroundings and the smaller Seto Kunda (white lake) has a seasonal pasture nearby. These lakes are said to have spiritual power. Stay overnight at tented camp. Trek from Base camp to Hindung (Gomba Danda) will be almost the same way back. However, stunning mountain views, surrounding landscape of mother nature and downhill jungle walk makes the trek pleasing. Stay overnight at tented camp. Follow the Tatopani (Hot Spring) River south to a built up riverside hot springs with a bathing pool and three taps. Relax and rejuvenate the body, mind and spirit. The trail onward follows stone steps built by Kadoorie Agri Aid Association and British Gurkhas of Nepal. Both organizations are active in this area and responsible for building many water taps, bridges and improved trails. Pass through Tir on the way to Racyat and Kapur villages. Stay overnight at tented camp. Pass through Lapchyat gaon which is a charming Gurung village with nearly 30 homes. Cross the Lapa Khola on a box bridge and ascend along a trail surrounded by fields to the walled compound of a newly built hospital of the large town of Lapa gaon with over 400 homes. Above Lapa gaon is Khading the largest Gurung village of the area. The residents have a welcoming spirit, and the people are enthusiastic to perform cultural dances with traditional music. Stay overnight at tented camp. Steeply up the hill to the west in a tall, blue pine forest with rambling rhododendron is Magne Goth, and nearby is a large boulder, location of ruby extraction. Stay overnight at tented camp. After Magne Goth, the trek enters Gorkha district. 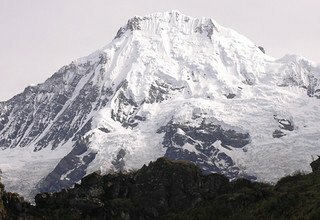 The trek goes downhill to cross Chote Khola before climbing through lush forest and descending into a valley with excellent panoramas including Manaslu, soaring in the western horizon. Pass through the scenic villages of Dhonjet, Kartunje and Manbu and re-enter Dhading district to reach the magnificently located Laphu Danda, a Bramhin village, with a large school and surrounded by bountiful fields. Take in views of snow-clad Himalchuli and Shringi peaks with a section of the Ganesh Range. Stay overnight at tented camp. The path climbs through fertile fields of Baseri as it ascends to Dandagaon, with excellent views of Manaslu and more. Continue gradually to the glorious twin waterfalls of Ganga Jamuna. Stay overnight at tented camp. This day will be quite easy walking day passing most of the Bhramin people&apos;s villages, paddy terraces and low land terrain views of the surroundings. Local culture, views of peaks of Manaslu range as well as the Akhu River are the major attractions of this day. Stay overnight at tented camp. Our private land cruiser pick you up from there and drive to Kathmandu from Tripura Sundari. The Ganesh Himal region and surrounding territory offers cultural and natural splendor and has religious significance, too, for pilgrims attracted to its sacred mountains and lakes. The area is filled with rare and exotic wildlife, wildflowers, herbal plants, yarsagumba, waterfalls, hills and peaks and hospitable people. While magnificent scenery graces every step, the residents of the beautiful landscape welcome visitors to their extraordinary land. Stay overnight at Hotel. Day 19: Final departure to International Airport as per your flight schedule.